Two Christmases ago, I wrote the following about Newsweek‘s semiannual Christian-baiting cover story. Their article that year was written by every atheist’s favorite New Testament scholar, Bart Ehrman, and his embrace of the “pious legend theory” regarding the virgin birth. What bothers me is not that Ehrman’s point of view is represented, but that his is the only point of view represented, as if people who actually believe in the virgin birth are members of the Flat Earth Society. There are plenty of other seriously good New Testament scholars and theologians—including, for example, that German one who now heads the Roman Catholic Church—who could happily go toe-to-toe with Ehrman on the facts. Do they still employ reporters at Newsweek, or is every article now an op-ed piece? Under the rules of journalism, a reporter would have represented these other voices. 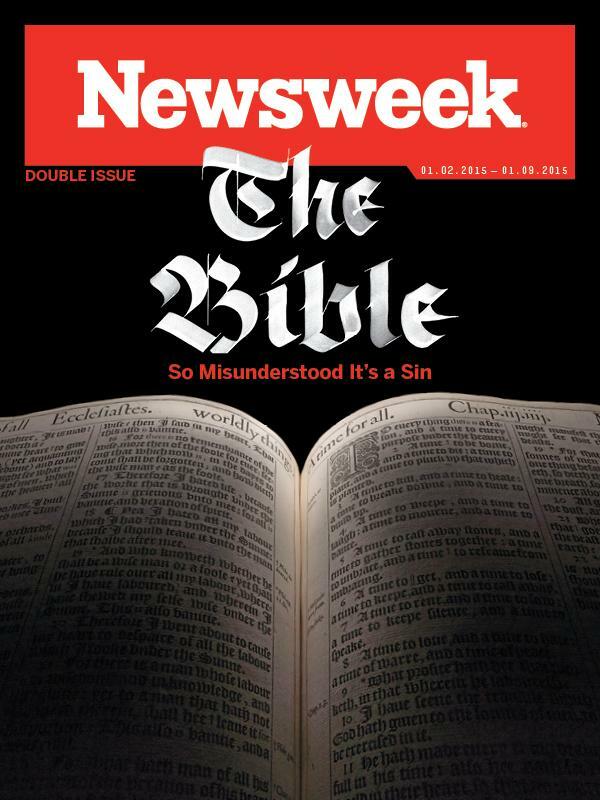 To their small credit, Newsweek at least employed a writer in Ehrman who has credentials—an actual Bible scholar at a university, however far outside of mainstream scholarship he may be. This year’s cover story, written by an uncredentialed journalist named Kurt Eichenwald, never lets facts stand in the way of a good story. I’m not exaggerating: Nearly every paragraph is wrong—wrong on facts, wrong on history, wrong on Bible scholarship (obviously). The title of the story, “The Bible: So Misunderstood It’s a Sin,” couldn’t be more ironic. Oh, dear. If he means to say that no one today has read the original autographs of the Hebrew and Greek manuscripts that make up our Bibles, then that’s true, but only trivially so. By that standard no one has read any ancient writing. But even worse: when we read Homer or Sophocles or Plato, we’re not only not reading the originals, we’re reading a translation (assuming we don’t know Greek) of copies of copies of copies that are far less well-attested than anything in the New Testament. Even if you’re a regular visitor to London, it’s probably never occurred to you to stop in to see William Shakespeare’s original manuscripts at the British Museum or Library. That’s just as well. There are no original manuscripts. Not so much as a couplet written in Shakespeare’s own hand has been proven to exist. When Eichenwald says that we’ve only read a “bad translation—a translation of translations of translations of hand-copied copies of copies of copies of copies, and on and on, hundreds of times,” he’s either, at best, stunningly ignorant or at least incredibly disingenuous. How else can we interpret his words? Where does this “translations of translations of translations” nonsense come from? He’s wrong, for example, when he asserts that the King James Version was a translation of the Latin Vulgate. (Mr. Eichenwald: Wikipedia is your friend. Or I think I might lend you my parents’ old World Book Encyclopedia.) The Douay–Rheims is an old Catholic English translation of the Vulgate, but even modern Catholic translations—like the New American Bible, the New Jerusalem Bible, and their descendants—translate the Hebrew and Greek. The King James translated a collection of Hebrew and Greek manuscripts known as the Textus Receptus. Newer Bible translations are generally more faithful to the original Hebrew and Greek because they’re based on older manuscripts than the ones the Church had access to in the seventeenth-century. The fact that we have access to so many manuscripts means that we can be more confident that our Bible reflects what its writers originally wrote. Regardless, the King James isn’t even a “translation of a translation”; it’s a translation of Greek and Hebrew manuscripts, just like any similar ancient writing, except, as I’ve noted, we have access to far older and more reliable manuscripts of biblical books than we do of other ancient writing. I could go on, but this is literally in Eichenwald’s first section. It doesn’t get better, I promise. Who exactly are these Christians “waving their Bibles” and “screaming their condemnations of homosexuals”? Surely if there were enough of them to “gather in football stadiums by the thousands” I would have seen more than two of them on a city street corner in the past 20 years. Or is he conflating evangelical Christians (not to mention faithful Catholics, Eastern Orthodox, and Anglican Christians) with the late Fred Phelps, whose Westboro Baptist had about a dozen members, mostly from the same family. Regardless, scholars are responding to his piece. Dr. James White is one of them. You can watch or listen to his in-depth response here. On Twitter, Eichenwald accused Dr. White of “name-calling” when White said that he was ignorant. But when you don’t know Hebrew or Greek, when you haven’t formally studied church history or Christian theology, when all your research is, at best, second-hand, what other word should we use? Ill-informed? Is that better? You’re either ignorant or you’re lying. At least being ignorant isn’t a knock against your character. This entry was posted on	December 27, 2014 at 1:08 pm	and is filed under Uncategorized. Brent you said it so well I’ll just say Amen! did you read the comments at end of Kruger’s blog? “don’t bother me with facts my mind is already made up.” is how most dissenters react in that debate. as our pastor said yesterday is how when Simeon made his declaration he predicted that while Jesus came to bring peace it was through division that He was to bring it. it’s not peace among peoples but between them and God. I did see some of those comments. Another theme of the comments, if I’m not mistaken, was something like, “You have your opinion, and we have ours”—as if Newsweek author’s point of view was equally valid. When did facts cease to be facts? When we did we stop being able to prove anything through argument and reason. Brent, Nothing new in this. Paul wrote of it in 1 Corinthians 1. What we believe is “foolishness” to the worldly wise. Unless God gives them eyes to hear and ears to hear, they will remain deaf to His Truth. Absolutely nothing new. Thanks, Grant! Miss you.